White terry cotton bathrobe embroidered with a name or initials of your choice. White terry cotton bathrobe embroidered with a name or initials of your choice. Lightweight robe with tie front waist belt two pockets and long sleeves kimono style. Made from soft super fine terry cotton fabric (not towelling fabric). White terry cotton bathrobe embroidered with a name or initials of your choice. Lightweight robe with tie front waist belt two pockets and long sleeves kimono style. Made from soft super fine terry cotton fabric (not towelling fabric). Fully machine washable and air dry or tumble dry on low. 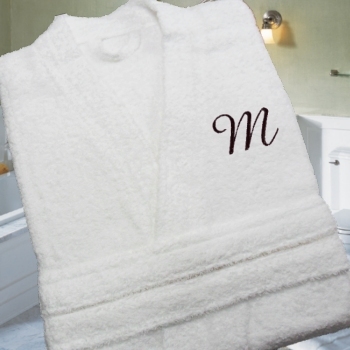 This robe is custom embroidered with any name or initials you like Your choice of lettering font and your favourite thread colour. Embroidery is on the upper left breast front of robe, this is ideal for a short name or initials. Or you can choose to have longer text embroidered across the upper back of the robe for a small additional charge. You can also choose Both, to have embroidered text across the upper back as well as the front - an additional charge applies. Please allow 3-4 working days for dispatch.